Click the button 'Click Here to buy additional returns'. You can then buy a return with a credit or debit card. Upload your accounts and comps. HTML require an iXBRL set of computations and either a pdf or iXBRL version of the accounts. If these are not included, you must include the reason why from one of the reasons in the drop‐down box. You can either use the box in the ‘Select File Here’ row, or if you have been sent any files by Easyfiler or viewed any using the viewer they will be in the download box where is says ‘or from store’. Select and press the appropriate Upload Form button. 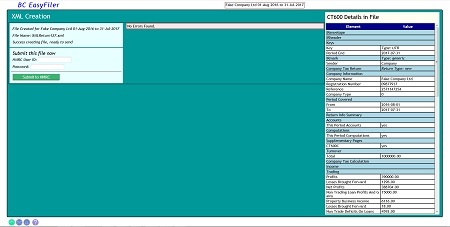 The system will know whether an iXBRL file is Accounts or Computations. Otherwise it will assume the file is a pdf. If using a pdf, choose what type it is from the appropriate drop‐down box before you press the Upload Form button. Please avoid using ‘.’s in filenames. 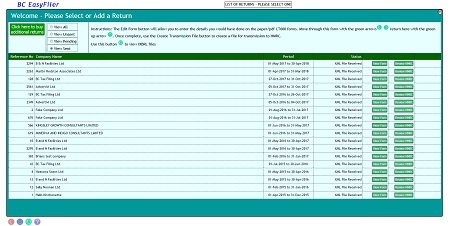 Uploading computations will update the return accordingly, with company name, dates and various figures. Updating accounts will update company registration and turnover. Some parts will not have been completed by analysing the comp. Pressing moves you through the form. Do thia and fill in anything you need to. Totals (in pink) will be calculated for you. If you need to refer to the HMRC CT600 guide, press . Two things that are not filled in by the form are whether it is a new or amended return and who is sending it Agent or Company. 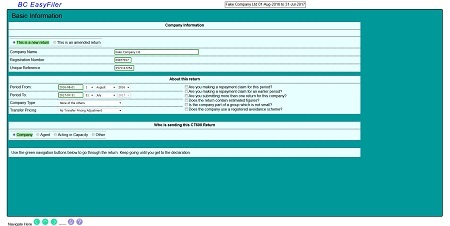 You may also need to fill out the capital allowance information. 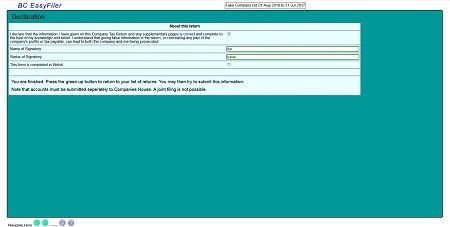 Press the ‘Prepare HMRC’ button. With any luck, it will say no errors found in the red block. You can review the information in the blue and white table on the right. You can also press the email button to get the details on the right sent to you or the print button to print it out. When you are happy, enter your government gateway username and password in the ‘Submit This File Now’ box. 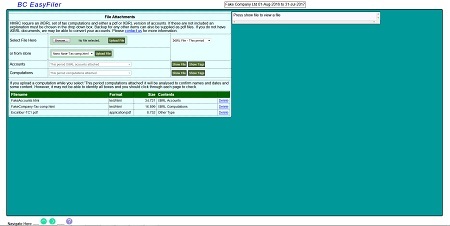 Assuming your password is correct, you will get a transition screen while the server waits for a response from HMRC. Then you will see this. 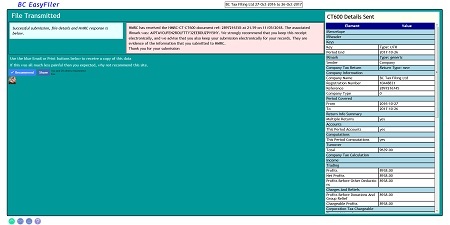 An email of the CT600 details will be sent to you. Hopefully, it will say successful submission, but if it does not you can go back and change things in the return. After a successful return you will be able to press ‘View Details Sent’ and see these details again at any time.